Baby Chicks or Full Grown Hens? Free Range, Tractors, or Coop? To Roo or Not to Roo? To Cull or not to Cull — That Tis the Question. A Sick Roo – What to Do? More on Coops–Designs & Such! Rabbits, Baby Chics & Turkeys! And We Have Baby Pekin Ducks! Pekins 2 Weeks Later : Baby Ducks Are Lots of Work! And this Little Piggy Went…. When do I Butcher Rabbits? Nutrition Breakdown. Wild Game, Guineafowl, Birds, etc. Lots of Chicken Scratch & Hen-Cackle!! I decided to make succotash tonight because I had four cobs of corn left from the corn on the cob I cooked from the other night. I didn’t want it to go to waste. I also fried up bacon for my potatoes and instead of doing the “ham” version of succotash that everyone else does, I decided to roll with bacon. Ready? Let’s start with Succotash. 4 ears of corn (If you want to use a can of corn, go ahead.) I like fresh corn so, I went with that. Lima Beans (16 oz bag) I use frozen. 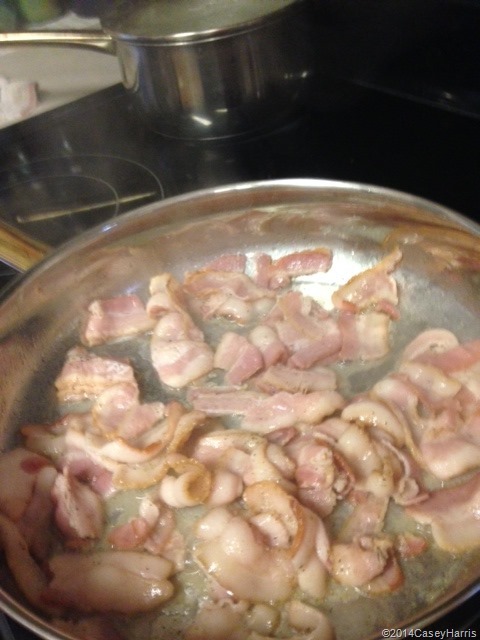 First, I use a stainless steel skillet to fry my bacon. I’ll explain why in a bit. Put your lima beans in a pot with water and start cooking on the stove. You can throw in some salt, butter, whatever. You want to cook these until tender. While that’s cooking…. Cut your bacon up and put it in the pan to fry. Here’s a trick—if you freeze your bacon, its real easy to cut up. Fry your bacon until its good and crispy. While that’s frying, grab the corn on the cob. Cut the corn off the cob – unless you are using a can. I recommend getting some fresh corn, though. There is nothing like it. 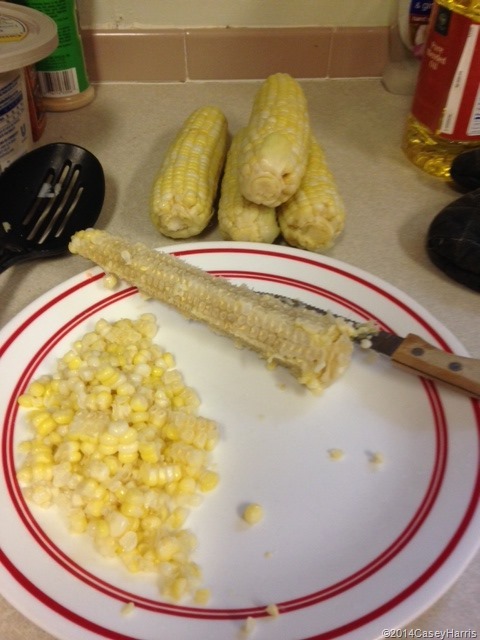 Also, my corn was already steamed, al dente. I don’t like my corn chewy but when you do yours, do it however you want. If you do it al dente or raw, set it to the side. Now, is the bacon nice and brown? If it is, pull the bacon out of the pan and sit it to the side to cool. Then, drain all of the grease (hope you save this) and leave only a couple of tablespoons in the pan. Leave all the bits, too. The reason I use a stainless steel pan, and if you do then you’ll see what I’m saying, the bottom of the pan should be nice and brown now. It wont come up if you scrap it. But if those limas are done, something magical is gonna happen. Take a good spoon with holes and start scooping your limas out of the pot. Put them in the pan with the bacon bits and grease. Even though the spoon is allowing the liquid to drain off, what tiny bit is left, will pull the brown off the bottom of the pan. Magic. This, my friend, is flavoring. And boy ol’ boy, what flavor it brings. Sauté those limas just a bit pulling up all those flavors and then add the corn and butter (you decide how much).. If its raw, only a few minutes on the heat will al dente it up. If it’s already al dente, then throw in some butter and all you need is enough time for that to melt. Salt and Pepper to taste. Now, pull it off the heat and go back to your bacon. 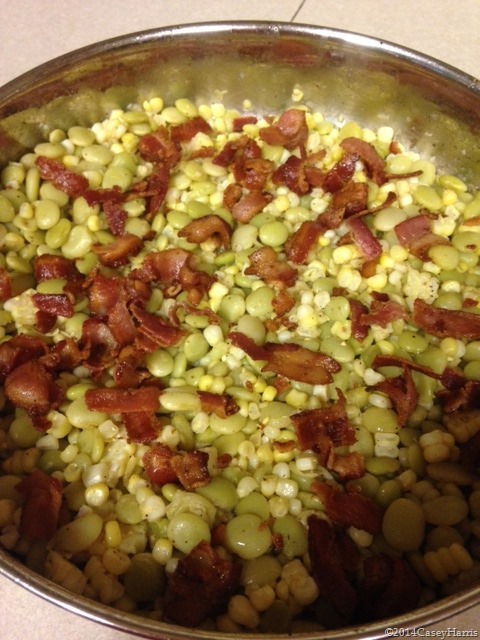 Crush it up and sprinkle on top of the Succotash just before serving. I sprinkle before serving because I want my bacon to stay crisp. Now get you a plate and eat it up! Let me know how ya like it or if you add something to the mix! There are tons of ways to make succotash, also. My Grandma used to add ham and onions. One woman I knew, used to add green beans as well. In other words, play around and have fun with it. It’s your world! A Storm is Coming! Quick, Grab all of the Bread and Milk! Water Bath or Pressure Canner? And a Vintage Water Bath Chart.